of the end of XIII – early XIV c.
Chapter I. The epoch of Dmitry Donskoy? and has not yet been edited. So it can be used only for general introduction. Now we can proceed to the early post-Mongolian architecture Tver Grand Duchy - old rival of Moscow. First stop at the Dormition Cathedral of the%238. El khvorostova, in 1982 and 1986-1987 making excavations of the temple, took it to the beginning of the XVI century, but then on the basis of archaic system of continuous foundations, linking Western pillars with the walls of the temple, took the Dating of the XIII century as a valid239. - thirdly, as we have shown in paragraph 8 of the main 1, the application of a structural system (in this case - the archaic foundations) do not serve as the basis for the Dating of the Church "by analogy". - fourth, as suggested El khvorostova, the temple could not be four pillars and columns with large Western vestibule, i.e. found strip foundations could not the Sabbath.241 (Fig. 36), and then we do not have the right to talk about the archaic system of the foundations of the Cathedral. Fig. 36. 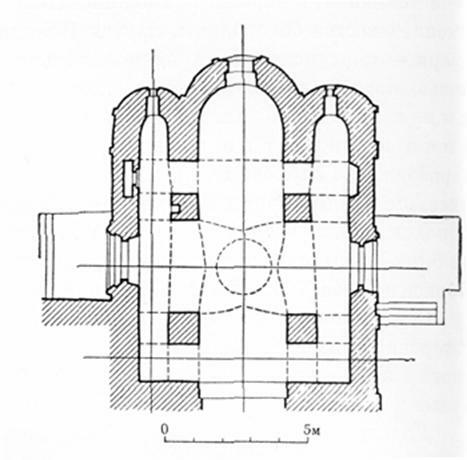 The plan of the assumption Cathedral of the Founding of the monastery. Reconstruction Elaborately. - fifth, in the pre-Mongolian and early post-Mongolian time dedication thrones assumption of the virgin was more characteristic of the cathedrals. 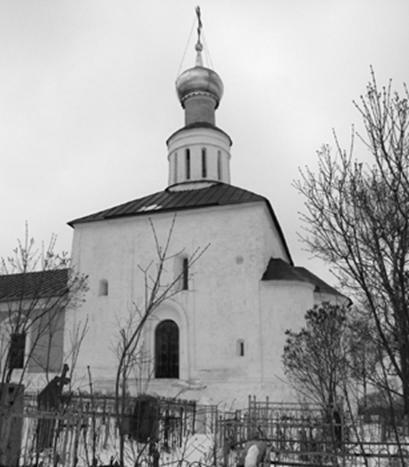 Of course, there were exceptions (such as the assumption Cathedral of the Knyaginin monastery in Vladimir), and yet it is the dedication of the small suburban Church of the monastery of the XIII century seems unlikely. After all, even in the Tver Cathedral, built in 1285-1290 years, had a more "modest" dedication - Transfiguration of the Saviour. Thus, to the Dating of the assumption Cathedral of the Founding of the monastery of the XIII century we can not. To date, the most likely time of its construction still seen XV-XVI century. Let us consider another monument post-Mongol Tver architecture - the Church of the Nativity of the virgin in the village of Gorodnya Tver region. This temple, in contrast to the assumption Cathedral of the founding of the monastery, had a chance to reach our days in high condition. The village of Gorodnya identified with vertyazinom, a fortress on the near approaches to Tver242. Both of these titles - Gorodnya Vertyazin - coexisted in the annals of the XIV and XV century, almost equal rights243. But we already mentioned in paragraph 7 main 2 that during the colonization of North-Eastern Russia in XII-XIV centuries the imagination of the princes and their advisers were not enough. So "anonymous" name (Town, Gorodesk, Settlement etc) are usually preceded by "individual". Where did the name "Vertyazin", we can only guess. Perhaps there were repulsed ("tapped"), some enemy troops. Perhaps there produced Vert - coarse yarn244. But in any case, "impersonal" name - Gorodnya, apparently referring to the period of construction of the fortress with Gorodnya (felled buried soil), seen by primary. For example, another stronghold of the Tver Principality - Bayou - in XV-XVI centuries, also called "impersonal" - Town245. Because the village is called Gorodnya and in our time, for clarity, we will use this version of the name. Thus, the Church of the Nativity of the virgin in Gorodnya - four-column apses of the temple on the basement. General view of the Church is shown in Fig. 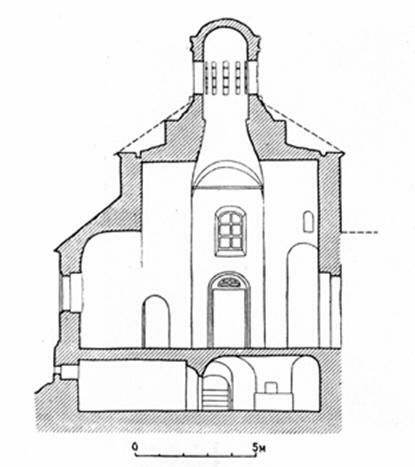 37, plans and sections of the upper and lower churches - in Fig. 38, 39 and 40. Check: it will just about two temples - the upper and the lower (podkletnom)as in the basement were also found traces of the throne246. Fig. 37. The Church of the Nativity of the virgin in Gorodnya. General view. Fig. 38. 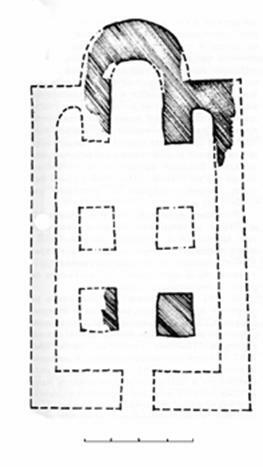 The plan of the upper house in Gorodnya. Fig. 39. 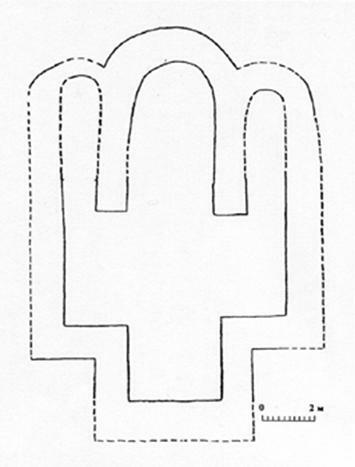 The plan of the lower temple in Gorodnya. Fig. 40. The section Church of the Nativity of the virgin in Gorodnya. The system sets the upper house rather peculiar (southern and Northern arches slightly increased, East and West merge with arches, - however, such a device codes could be the result of later reruns247). Arch expands in the direction of the castle, forming a "star-like" plan. Between the arches and small drum - conical transition, which corresponds to the outside high rectangular pedestal. The upper corners of the Western Church occupied the small closed chambers. N.N. Voronin believed that these were the premises for valuables248and Vl.v.sedov - that they were chapels in the choir, the presence of the researcher, respectively, also assumed249. Laying upper and lower churches fundamentally different (Fig. 41 and 42). The basement is not built in a half-rubble, and in the rubble technique - in all likelihood, using form. Laying the upper house polubutovaya, its distinguished semifinished "processing of low-quality white stone blocks (average face size 30 x 40 cm) and sloppy fitting joints, forcing builders to apply a thick solution. At the temple we see and well-treated details - portals, basement, cornices and pilasters (Fig. 43). Fig. 41. Masonry podkletny and upper churches in Gorodnya (outside view). Fig. 42. The laying of the temple podkletnogo in Gorodnya (inside view). Fig. 43. The cap and base pilasters of the Church of the Nativity of the virgin in Gorodnya. The Church was examined by N.N. Voronin in 1928250 and refurbished under the supervision BL Altshuller in the late 1970's. Chronicles on the time of construction of the Church of the Nativity of the virgin are missing. There are two conflicting messages patrol and opasnoi books of XVII century251 relating the construction of the temple to a wide time span from the end of XIV until mid XV century - the reign or Ivan Mikhailovich and his son Alexander Ivanovich (1399-1425), or Boris Alexandrovich (1425-1461). It is only known that the Church in Gorodnya existed before the fire 1412, when she, according to the Chronicles, "was burned"252. On the basis of this information and the various techniques of laying podkletny and upper churches N.N. Voronin believed that the Church of the Nativity of the virgin was built in the end of XIV century, then in 1412, it burned down, and in 1440 years of its upper part was completely rebuilt253. Justifying its Dating, the investigator wrote that the upper house in Gorodnya has the "star" plan arches, extending to the castle, and this brings him to the Trinity Cathedral in the Trinity-Sergius254. N.N. 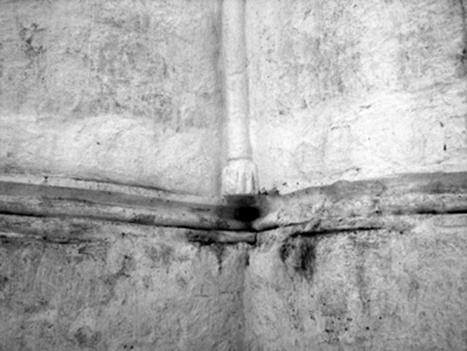 Voronin to connect the upper temple and Zvenigorod churches abroad of the XIV and XV centuries, pointing out some resemblance window frames255. Altshuler, referring only to the hypothetical assumption Voronin about Dating basement end of XIV century256nevertheless, stated: "Now it is possible to consider (sic! - SZ)that from the first stone Church, built probably in the last quarter of the fourteenth century, remained only the basement and the upper Church is thorough reconstruction of the building after the fire 1412., i.e. to the first third of the XV century"257. In recent decades, the history of construction of the Church "overgrown" many local legends, fueled by AA galashevichem and Goscomecology258 (for the sake of justice we will notice that some of these legends have been initiated yet BL Altshuller259). So, the construction of the lower Church (as well as the top, we think "pogorevshikh" in 1412) and associated with the 10th anniversary of the Kulikovo battle took place on 8 September 1380, on the eve of the feast of the Nativity of the virgin), and the activities of Metropolitan Cyprian, who visited Tver July 2 1390260. Finally, arranged in the southern apse of the upper house chapel of St. John the Baptist (the niche in the wall for the altar) is associated with the name day of Ivan Mikhailovich (great Prince of Tver in 1399-1425 years) and is an additional reason for attributing the top of the temple to the first third of the XV century. Let's look at the order of all the arguments offered by the Dating of the lower Church in Gorodnya end of the XIV century, and the upper - the first third of the XV century. First, we note that after the fire in 1412, the Church, most likely, was not rebuilt, but only been restored. The relatively small scale of these works, says the chronicle, after the city and the Church in 1412 "was burned, Prince Alexander Ivanovich "packs founded the City and put a lot of people tverich and Kashintsev and cut down byst hastened to collect his"261. If after the fire had to any stone buildings, it is unlikely to escape from such attention chronicler. Thus, damage to the temple was relatively small - for example, you could burn the roof and the interior. Besides, let us not forget that Gorodnya was a fortress and around it "the main tower" - the Church of the Nativity of the virgin is certainly was vacant space (necessary and as "fire zone", and for a possible effective fire from the Windows of the drum). Not a convincing argument for the Dating of the upper house in Gorodnya first third of the XV century and what N.N. Voronin, "star" plan arches, extending to the castle, brings together the Church of the Nativity of the virgin in Gorodnya with the Trinity Cathedral in the Trinity-Sergius262. And here we must fully agree with BL Altshuller, note that to link the Church in Gorodnya with the work of Trinity masters there is no reason263. And arches widen the castle and the temple of the village of Kamenka (see Fig. 7). There is no reason to link (even indirectly) the Church of the Nativity of the virgin and Zvenigorod churches abroad of the XIV and XV centuries. 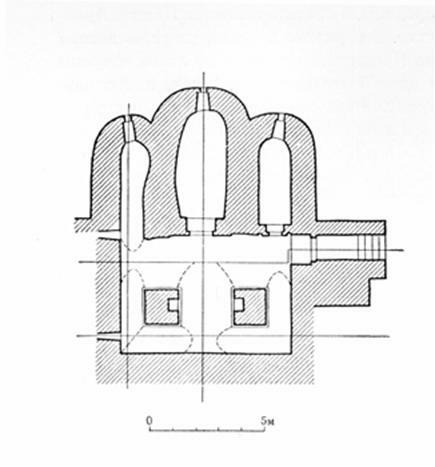 Differences in architectural sculpture, proportions (see Annex 1), design and technology of a laying of walls of temples Gorodnya Zvenigorod far more important than some resemblance window frames, noted Voronin264. Besides the similarity of those or other well-treated details of architectural decoration (or elements of portals or window openings, or plinth, or capitals, etc) tends to occur in any random sample of monuments of architecture of North-Eastern Russia XII-XVI centuries. We have already stated in paragraph (10 sec. 1. So, any documentary and typological grounds for attributing the Church of the Nativity of the virgin at the end of the XIV-the first third of the XV century we didn't have. Let us consider the local legends about the history of the Church, established in the last decade. The reason for the emergence of such a legend, no doubt, was the dedication of the altar of the Church in Gorodnya Nativity - as we have already noted, the battle took place on the eve of this holiday. And as in 1390 in Tver traveled Metropolitan Cyprian (which, in principle, could lay or consecrate the Church), this date as if even find some confirmation. But above all, think about it: could one or the other Church in the Tver Principality be devoted to the battle on the Kulikovo field? Was the victory of Dmitry Donskoy Khan Mamai holiday for Tver? In 1375 Dmitry Donskoy Tver besieged and sacked all estates Tver Grand Duke Mikhail Alexandrovich266. In 1380 Michael of Tver in the Kulikovo battle was not involved, but was part of his rival, Vasily Kashin267. At this time the Grand Duchy of Tver was an ally of Lithuania268, and Lithuania - ally to Horde (at least formally)269. And not in vain immediately after the capture of Moscow Tokhtamysh in 1382 Mikhail Alexandrovich immediately went to the Horde in the hope of getting the label on the Grand Principality270. So will be in Tver, began to celebrate any anniversary of the Kulikovo battle and found a Church in honour of the victory in Moscow - a deadly enemy, which over the last several decades, were constantly at war? Enemy, recently (in 1375) plundered Tver Principality of Tver Tver and imposed peace271? Of course not. Now look, was whether or not an anniversary of the victory over Dmitry Mamai holiday for Metropolitan Cyprian. According to the legend, during this visit to Tver (in the year of the 10th anniversary of the Kulikovo battle) laid the Metropolitan Church in Gorodnya. But repeated almost word for word: is Cyprian would lay any temples in honor of the victory of his worst enemy - Dmitry Donskoy? Generally speaking, hardly the end of the XIV century, someone was able to understand the significance and extent of General Russian victory in the Kulikovo field. By any military-strategic and political canons of the time victory was a "Pyrrhic victory": two years after Russia was defeated by Tokhtamysh, and the influence of the Horde fully restored for several decades. Of course, it was important "to dispel the myth of invincibility of the Tatars", but, probably, it Sergius of Radonezh was a supporter of the policy of a sample of Ivan Kalita" and discouraged Dmitry from direct confrontation with the Horde274. But even if the significance of the battle of Kulikovo and was adequately perceived by some contemporaries, then do a Greek Cyprian, having lived in North-Eastern Russia a year (1381-1382)who had so imbued all-Russian interests, which, being expelled Dmitry Donskoy (and having been in exile for eight years), immediately upon his return, he decided to build a temple in honor of the victory drove his Prince? And not in Moscow (where it would be, at least, politically justified), and in Tver, where the Moscow Prince hated? It is quite unlikely. Hypothesis Voronin about the dedication of the victory on Kulikovo field the Church of the Nativity of the Theotokos in the Moscow Kremlin (1393) based on the fact that the temple was founded on September 8, the eve and the day and the 13th anniversary of the victory in the battle275. And in Tver in 1390 Cyprian came 2 July276 and this date is not exactly have anything to do with the Kulikovo battle, nor to the feast of the Nativity of the virgin. So, the legend about the founding of the Church in Gorodnya Metropolitan Cyprian's also no reason. - secondly, the namesake Saint Prince Ivan could not be John the Baptist, as, for example, John Climacus or John the Theologian. - third, even vowed thrones often had no connection with the namesake saints (for example, Ivan III made a vow in case of a victory over Novgorod to build the Archangel Cathedral in Moscow chapel Akili). There are other reasons to doubt the validity of the Dating temple in Gorodnya proposed by N.N. Voronin and BL Altshuller. N.N. Voronin called the Church of the Nativity of the virgin "provincial, naive, and probably retarded piece"277. Echoed him and Altshuler: "Technical and largely artistic imperfection Tver built certainly... you Can call, and many other absurdities, which suggest a very poor training of the Builder of the upper Church of the Nativity, the more hardly able to offer their own proprietary solutions"278. Fig. 44. The Church of the Nativity of the virgin in Gorodnya. On the background of vertical window jamb late chapel visible distortion of the Northern wall of the temple. Fig. 45. The South-Eastern corner of the Church of the Nativity of the virgin in Gorodnya. Well seen sloppy construction of the temple. But Gorodnya "made out" access to Tver by main rival of Moscow, and its value was not less than the second main strength of the Tver Principality - Old women. And there at the end of the XIV century was built the Cathedral of the Archangel, the size and accuracy of masonry is quite comparable to the magnificent temples of the Moscow late XIV-early XV century279. Even more strange assumption BL Altshuller that "imperfect" (on his own, just quoted, word) Church of the Nativity of the virgin was built "Moscow Metropolitan or great wizard," which had, apparently, to contribute to achieving the political goals of the Moscow Principality, and sought a way to strengthen its position"280. 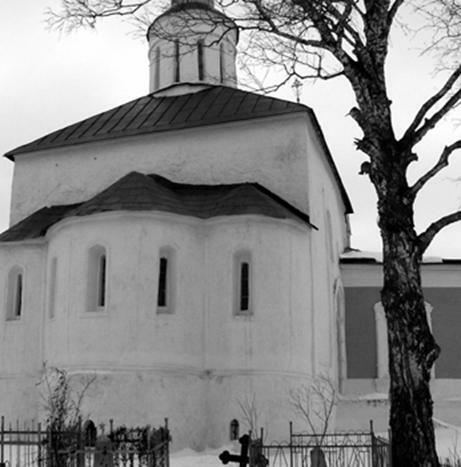 In this case, "imperfect" Church in Gorodnya would be a blow to the prestige not only of Tver, and Moscow princes. The situation turns completely implausible. And since, as we have seen, no typological, archaeological and documentary evidence erection of the Church of the Nativity of the virgin at the end of XIV-early XV centuries, we have no need to consider Dating temple again. The fortress Gorodnya guarded near the outskirts of Tver, and maintain its defensive significance of almost all time of existence of the Tver Grand table. It was hard to avoid attacking the Principality of Tver and Moscow, and from the Horde, and even from Pereslavl-Zalessky, actually attached to Moscow in 1302. Using the method of historical and motivational model, we can hypothesize that the stone temple in Gorodnya could be built either to 1327 - the defeat of Tver Kalita and Tatars or after 1350-ies, when the situation on the border Moscow and Tver deteriorated again281. But, of course, this consideration cannot be called even approximate Dating. - thirdly, all the North-Western analogues of certain elements of the forms and designs gorodenskoy churches scattered in time from the end of XII to the end of the XV century. But the crucial information in favor of the earlier Dating of the Church of the Nativity of the Theotokos give us the work of the Architectural and archaeological expedition of the State Hermitage, who worked in 1986-1991 in Rostov the Great. M. ioannisyanom and his colleagues had found the Church of Boris and Gleb 1287 (Fig. 46), composed of relatively small stones, shed%15 cm and rather rudely treated blocks of porous limestone283. Such a clutch can not even formally called the half-rubble - it is a clean boot, and for its construction required the formwork, traces of which were also able to detect284. It was also found a piece of carved white-stone cornice of the Church 1287, made in a relatively smooth technique (though more "primitive"than the pre-Mongolian counterparts)285. Fig. 46. The plan of the Church of Boris and Gleb in Rostov. Reconstruction M. Ioannisyan. M. ioannisyan in this regard, wrote about the similarity of construction equipment Rostov Church of Boris and Gleb with basement of the temple in Gorodnya286. One cannot say that this similarity was the absolute - in the rubble of the Rostov temple stones smaller size, and stacked them, unlike podkletnogo temple in Gorodnya, completely randomly. But in the North-Eastern Russia no more rubble of the temples we do not know - neither in the pre-Mongol, nor in the post-Mongol period. In this regard, we have every reason to approach the Dating of these two unique buildings. Another powerful argument in favor of Dating the Church of the Nativity of the virgin before 1327 - the defeat of Tver Kalita - seen the similarity of the upper house in Gorodnya and Nikolskaya Church in Kamenskoye. N.N. Voronin in this plan noted crude white-stone masonry and tapered transition from the arches to the drum, just allowing the possibility of simultaneous construction of these temples287. Altshuler wrote about the similarities multi-window lintels and also attributed these temples to one of the construction period288. In both churches walls barrel, plans marked not quite accurate. It should also be noted that the base, portals and all other details of architectural decoration of churches and in Gorodnya and Kamenskoye (and also on the Settlement are made relatively well-treated stone and contrast sharply with the rough surface of the walls. The fact that in the Church of the Nativity of the virgin profile cap is of the form "goose", and St. Nicholas Church in the attic, he said anything about individual craftsmen who built these temples, or the specifics of the customer's requirements. For example, in Kolomna Church, preceded the assumption Cathedral of Dmitry Donskoy, the cap had a form of Gothic "heel" (Fig. 35). 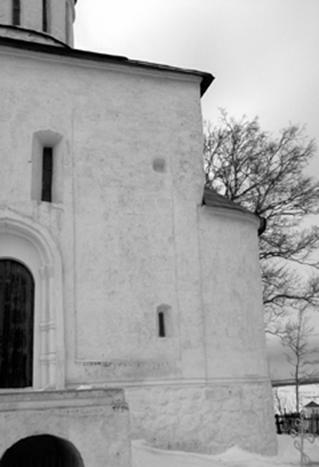 Thus, the technique of construction and architectural and stylistic features of the Church in Gorodnya share it with the terms of buildings is not the end of the XIV-beginning of XV century and the end of the XIII century to the first third of the XIV century. The Dating of the lower Church, we may reconcile with the Church of Boris and Gleb in Rostov (1287), and the top - from churches to the Settlement and Kamenskoye (late 1300's-early 1310's). And since, as we have seen, the Church of the Nativity of the virgin in General could be built either to the defeat of Tver Ivan Kalita, or after 1350-ies, we can with certainty to offer its General Dating to 1327. But the upper temple in Gorodnya different churches in Kamenskoye and at the Settlement four pillars of the plan, the greater the height, the presence of substructure and a little more careful treatment and fitting white stone blocks. This is consistent with the primacy of Tver among Russian principalities in the end of XIII-XIV century. But after the assassination in 1318 Yury Danilovich Michael Yaroslavich started the actual decline of the Tver Principality. 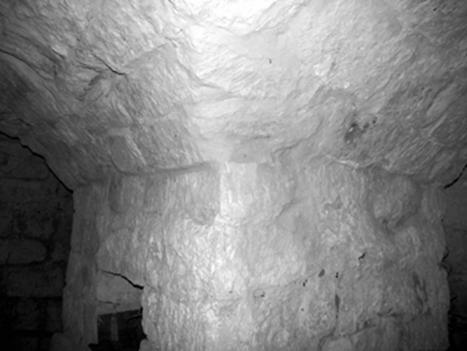 In this connection it is possible to reduce the "upper bound" date of construction of the Church of the Nativity of the virgin until 1318. For the "lower limit" we can take 1290 year - completion of the construction of the Savior Cathedral in Tver. We have four possible hypotheses about how were built lower and upper churches. The first hypothesis: the construction gorodenskoy Church began in the period between 1290 and 1292 years. Envisaged the construction of a small temple in the rubble technique without substructure. But then the construction was interrupted. The reason for stopping the construction work could be, for example, the invasion of the Tatars in 1293. Khan Duden captured and sacked Murom, Suzdal, Vladimir, St. George, Pereslavl, Uglich, Kolomna, Moscow, Dmitrov, Mozhaisk, and several other cities. Then Duden joined the Tver Principality and, a little bit not reached the Tver, turned in the direction of Novgorod289. But a frontier fortress Gorodnya in any case appeared on the direction of the main blow of the Tatars, and probably it was taken and plundered: principles of military strategy that time is not recommended to keep in the rear of the strongholds of the enemy. However, the Church's construction could be started and later - in the mid-nineties of the XIII century, and the reason it stops could be the fire of Tver 1298 year, when burned the Grand Palace with all Treasury290. Such catastrophic fire could lead to enormous savings. In any case, when you stop the construction of m is%2 m and he was above ground level, as evidenced by the pledged window291). And in the beginning of XIV century was put on top of the new high temple, already in the half-rubble technology. The second hypothesis: in the early to mid-1290-ies the Church of the Nativity of the virgin was built in full, both upper and lower (podkletny) temples were rubble. But the temple was a "fortress", the master was erected it in a hurry (as evidenced by an incorrect split of the plan) and did not wait shrinkage basement. It is not surprising that in ten or twenty years the upper Church fell into disrepair and was rebuilt - in the more prestigious the half-rubble technology. The third hypothesis: first the upper temple was built in 1290-ies in the rubble technique simultaneously with the lower temple (as we expected and in the second hypothesis), but already in the beginning of XIV century it ceased to meet the prestige of Tver and was rebuilt in the half-rubble technology with a significant increase in height. This situation could be caused by construction of the first Moscow%292 one can assume that the location of this fortress is most likely in the area of modern Solnechnogorsk). The fourth hypothesis is similar to the third, but with the difference that the upper Church at first no - may, the economic and political situation in the Tver Principality end of the XIII century it was possible to build in a border fortress only cave temple. The author is inclined to the first hypothesis, since the laying of the vault in the basement is somewhat different from the masonry pillars, and the transition between these clutches rather sharply (see Fig. 42). But, unfortunately, we have too little information to give preference to one or the other hypothesis. So leave all four as equivalent. The question of the nature of the initial completion of the facades of the Church of the Nativity of the virgin in Gorodnya still has a unique solution. N.N. Voronin on the basis of the remnants of the white stone cornice believed that the completion of the facades was straight293. Altshuler, suggesting the presence on the facades and Gables294when restoring the Church in 1970-ies still followed position Voronin as "because of the unusual partitioning of the facades of the Church "model" completion form, known by other monuments, was in this case is not quite applicable"295. We, having archeological evidence-based reconstruction of the St. Nicholas Church in Kamenskoye (Fig. 9) and data on the origin of the temples in Gorodnya and Kamensky a construction period, is also entitled to assume that the facades of the Church of the Nativity ended zakomaras. A preserved cornice could "cut off" from zakomaras parts of the walls. But we cannot agree with the statement BL Altshuller about "unusual" division of the facades of the temple in Gorodnya. Some "unusual" is simply that the blade (except corner) are made on the basis of buttresses: the upper part merged with the walls. But this is not a serious obstacle to reconstruction Gables: the shoulder-buttresses divide facades%2Archivolt could just join the cornice. So now we have to very seriously the figure A. meyerberg, committed trip to Russia in 1661-1663 years296 (Fig. 47). Fig. 47. The Church of the Nativity of the virgin in Gorodnya. Figure A. Meyerberg. To this figure, representing the Church of the Nativity of the virgin in Gorodnya, N.N. Voronin drew attention to detail297, but did not take it as useful information for the reconstruction of the top of the temple. 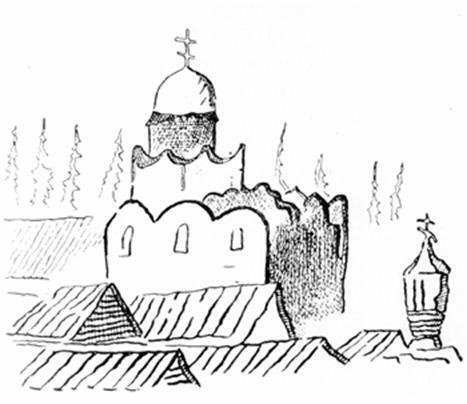 We, in connection with the mentioned in this paragraph may assume that the top of the Church in Gorodnya looked as it is depicted in Ameerberg, i.e. the zakomaras temple had a round end. Apparently, we should reconstruct zakomaras that way. Note the high probability that in figure A. meyerberg a drum Church of the Nativity of the virgin schematically of keel corbel arches. In this case, we see a very harmonious composition terminations gorodenskoy Church. 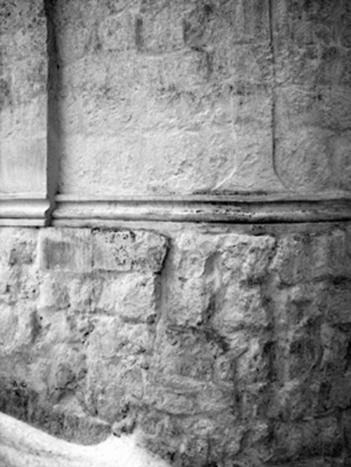 Blades that go deep into the wall, as buttresses, to create visual desire of the Church up. This desire podcherkivaet peaked innovative features, as if repeating the vertical cross, crowned by a narrow and tall drum. And smooth, wavy outlines end Gables, portals and low apses profitable overshadowing these "needle" of corbel arches and cross. Thus, the appearance of the Church of the Nativity of the virgin, crowned keel corbel arches and semicircular Gables, fully consistent with the basic principles of plastic Western Gothic.